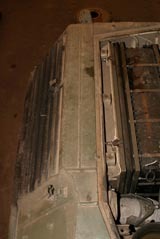 An Achilles Heel of the Leopard 1 tank were the side venting exhaust grilles located at the rear of the vehicle. 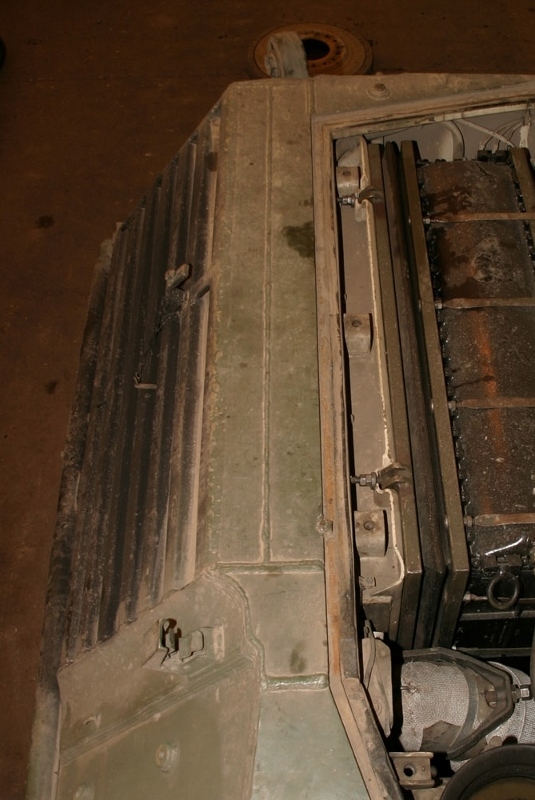 While the specific configuration of these vents was engineered with an up/down/up louvre placement to help prevent dirt from entering the engine compartment, this unfortunately made for the possible easy access of Soviet-made 14.5 mm rounds to enter and take out the engine. The design was later improved upon with the Leopard 2. 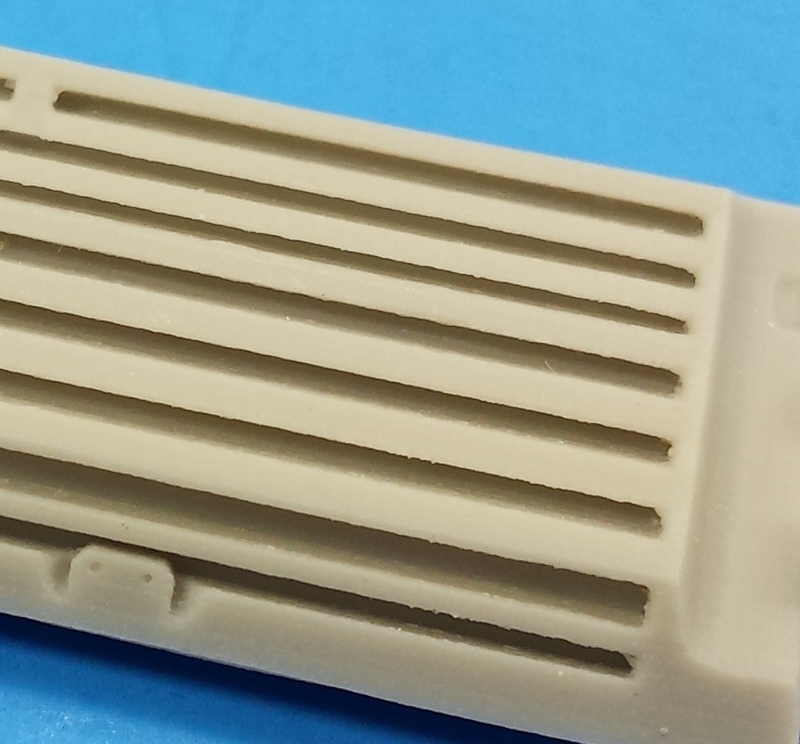 More often than not in modelling, there are specific items regarding a subject that get overlooked by the manufacture during the kit planning process. 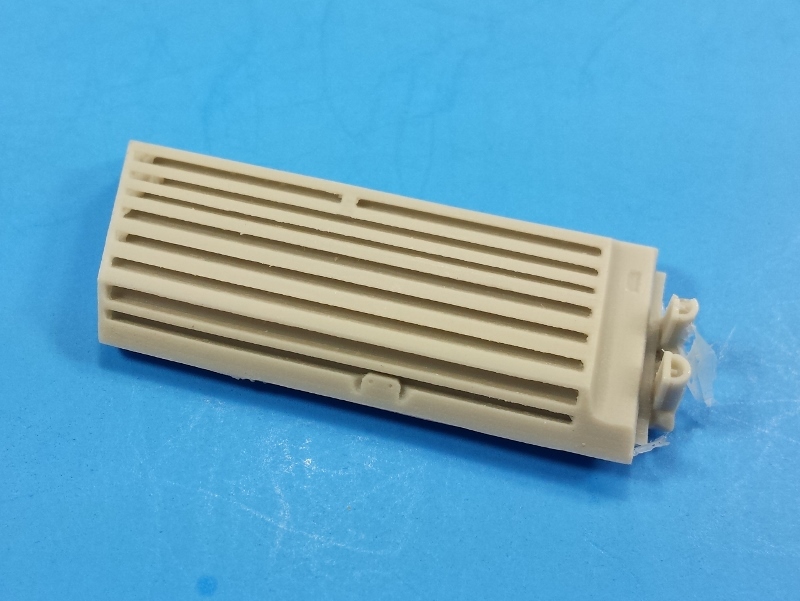 This lack of detail seems to be rather commonplace in the world of 1.35 scale Leopard 1 tank modelling. 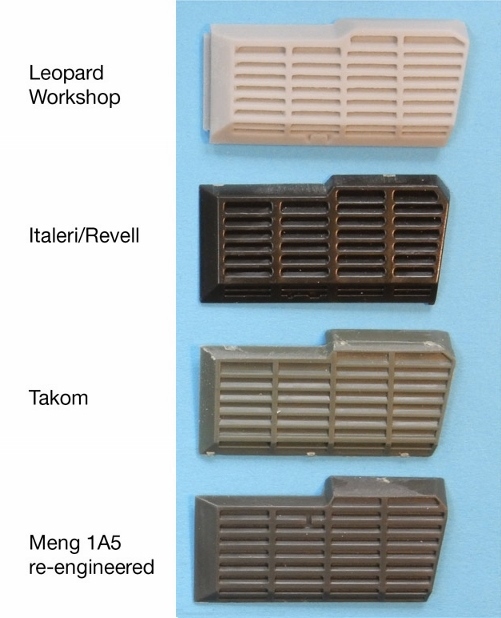 While the kits offered of the Leopard 1 tank from various manufacturers trade off the good and bad points between them, one thing remains fairly constant - the poorly replicated exhaust grilles for both the early and later versions of the Leopard 1 kits. 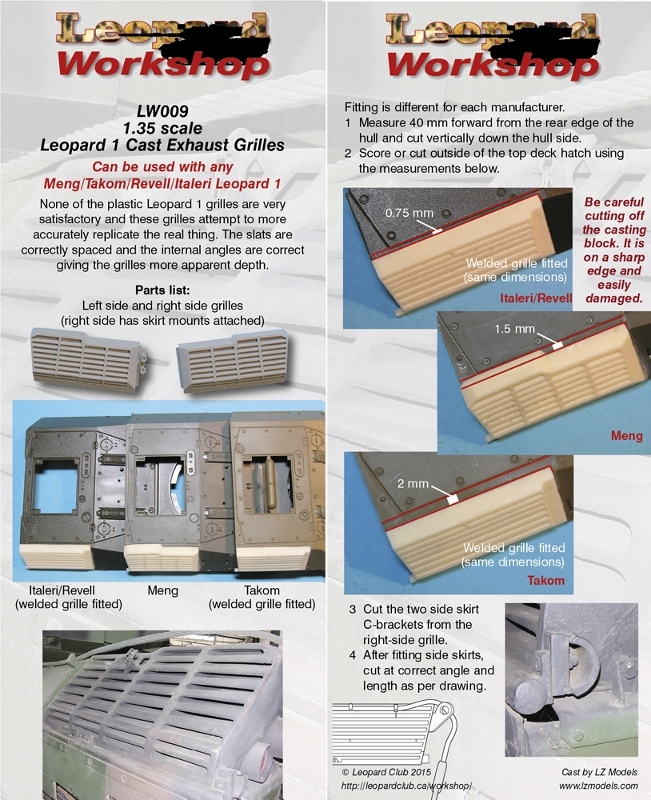 Leopard Workshop has recently released a fix to the poor design specifications and moulding offered by Leopard 1 kit manufactures with their two cast resin upgrades; Welded Exhaust Grilles LW008 and Cast Exhaust Grilles LW009 sets. 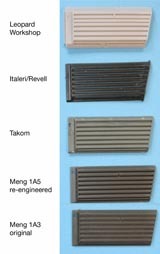 Each of these exhaust grille sets are sold in pairs (left and right handed) and are cast in resin. 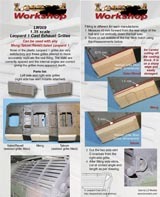 Along with the grilles, inside the package is a short instruction sheet explaining how the grilles are installed. 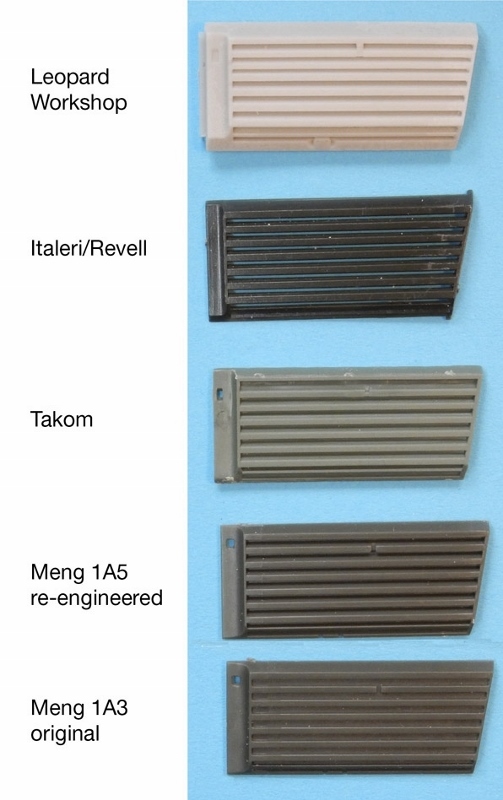 Looking over the grilles, the castings are crisp and free from air bubbles. 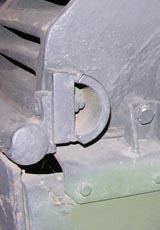 There is a minor amount of casting flash present where the seams of the moulds had come together. 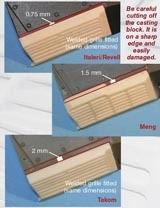 This is typical and removed easily with a light sanding. 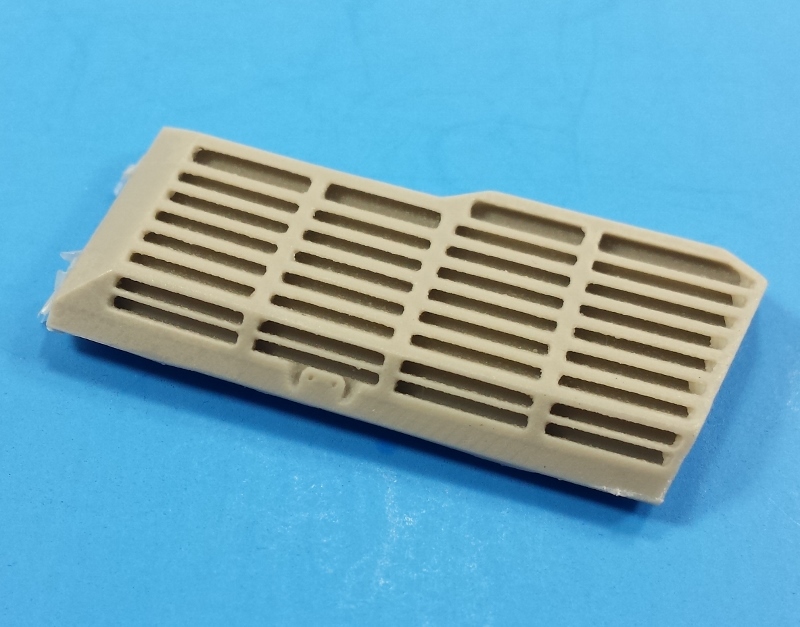 The LW008 set of resin Welded Exhaust Grilles replicate the later type of grilles used on Leopard 1 tanks. 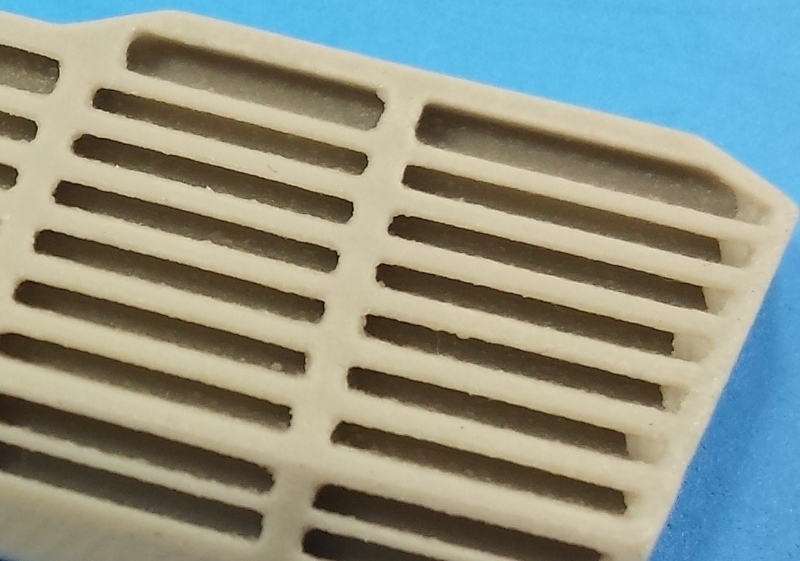 The mountings for the side skirts, as well as for the tow cables, are cast nicely into these grilles. Included with these grilles are the two small C-bracket which are located on the rear of the exhaust grilles to simulate the C-brackets used on the full-scale tank to support the side skirts of the tank. These have to be cut off placed correctly once the skirts are fitted. 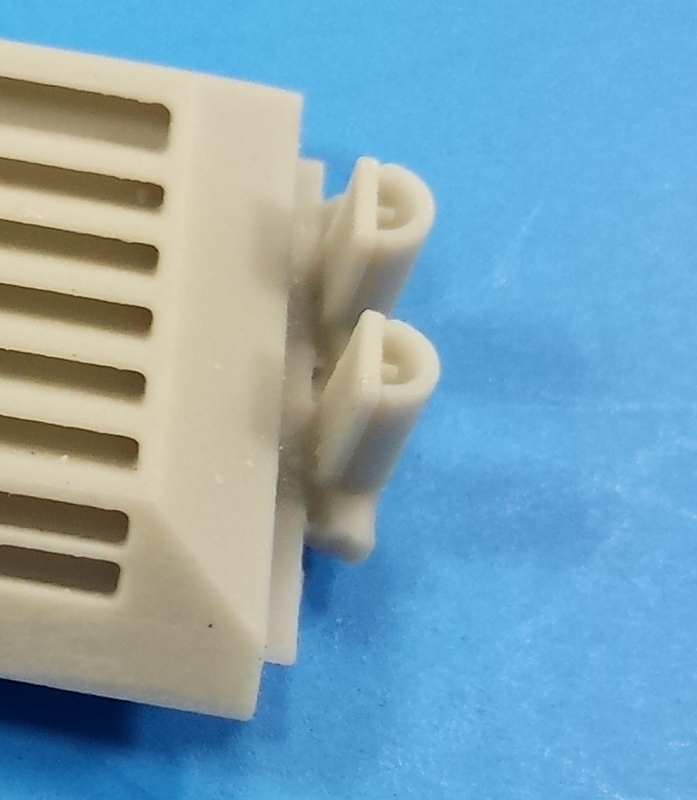 These brackets are largely neglected by the kit manufacturers. 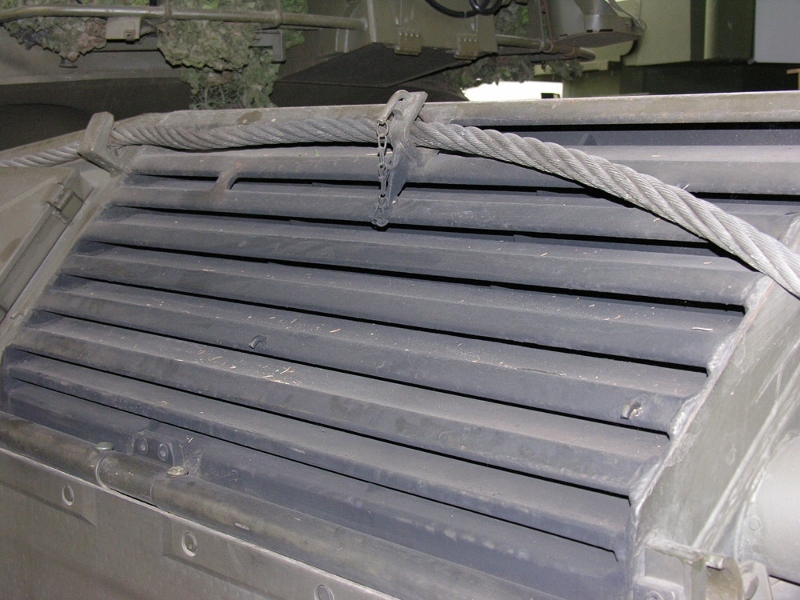 The louvres on the full-scale Leopard 1 with the welded grilles have two narrower openings that appear to be inconsistent with the rest of the louvre openings. 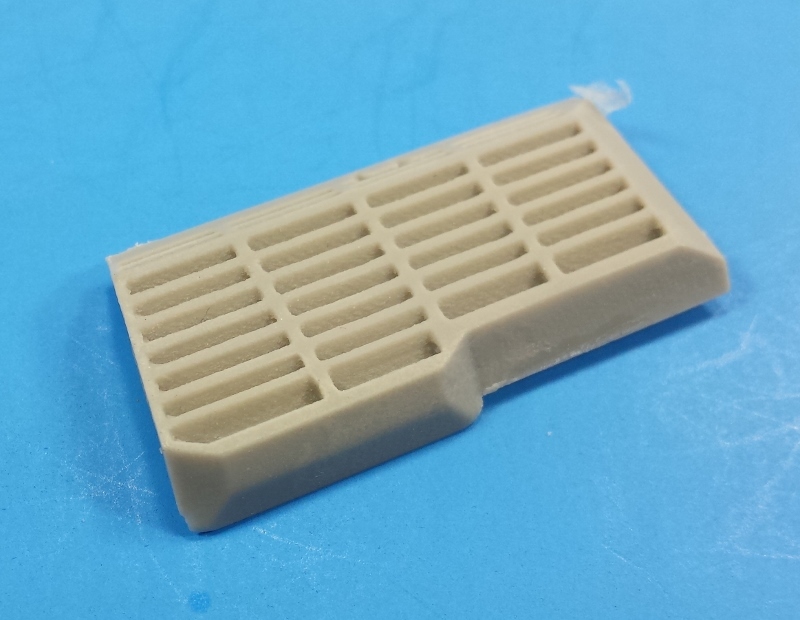 Unlike the five previous attempts by manufactures to create the scaled version of the grilles, the Leopard Workshop replacement grilles simulate the openings in the correct manor as seen on the full-sized version. 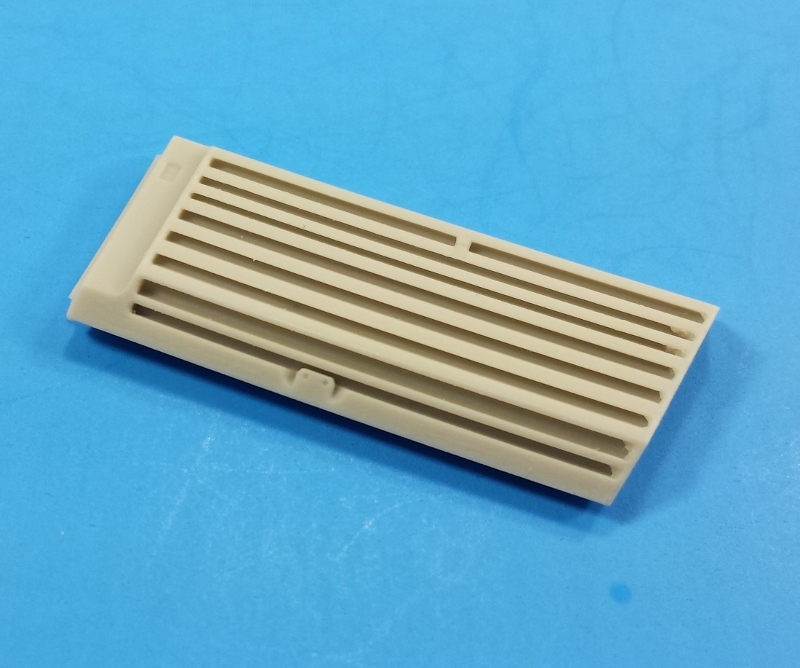 The LW009 set of resin Cast Exhaust Grilles replicate the earlier type versions of grilles used on the Leopard 1. 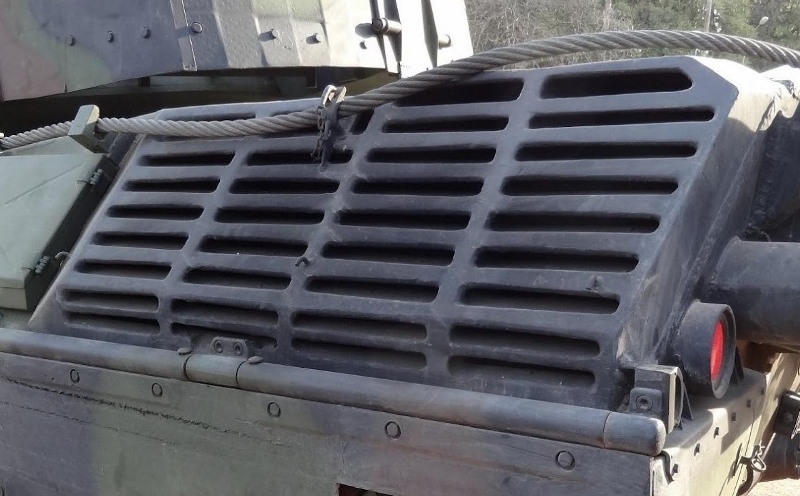 As seen with the LW008 replacement grilles, there is a bottom hinge mount cast into the grille as well as the C-bracket used to accurately represent the mounts to the side skirts to the tank. 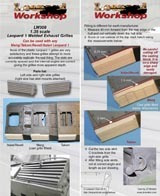 As seen with the welded version of the grilles, the louvre openings have different sizes. 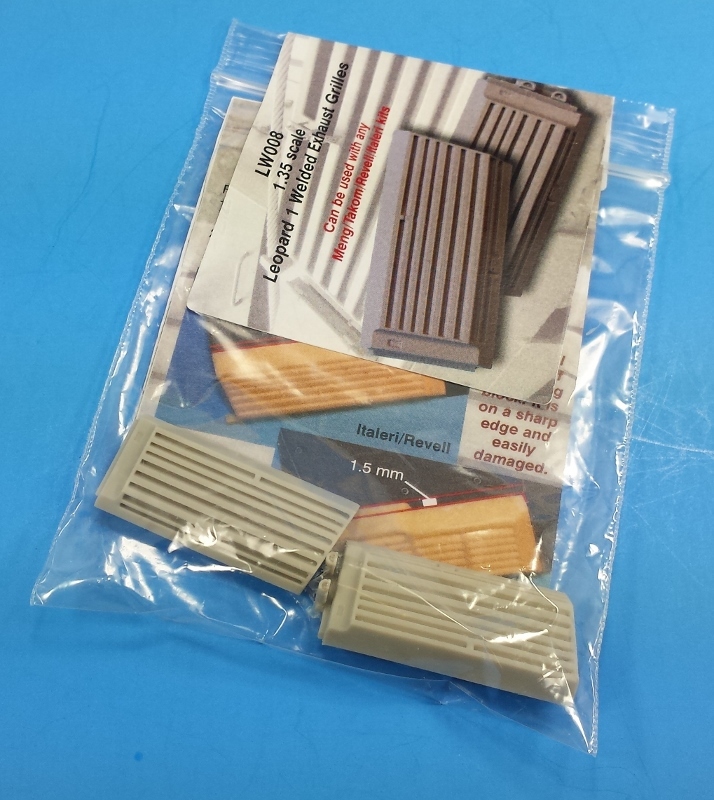 While only one of the four manufactured kits grilles make any attempt to simulate the different sizing, they fall short as there are not enough widths represented. 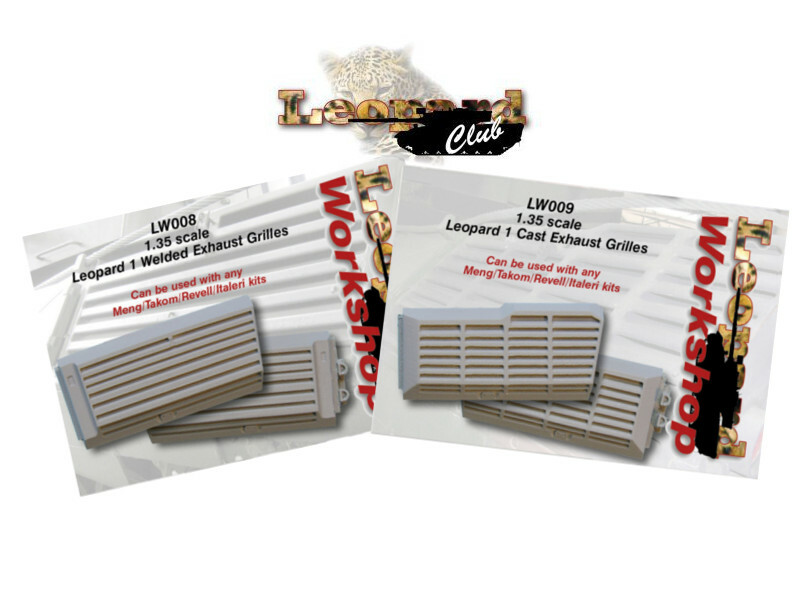 The Leopard Workshop grille replacements accurately represent the correct sizing of the louvre openings. 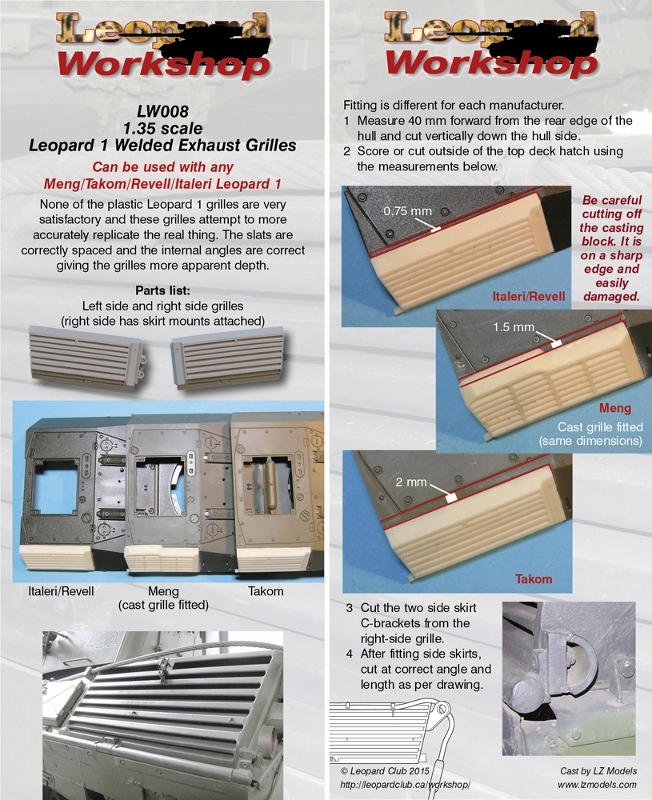 The added thickness of both sets of these Leopard Workshop exhaust grilles accomplishes a deeper appearance to the louvres on the grilles as well as creating the correct seam lines to the top and rear sections of the vents as seen on the actual tank. With the installation of either the LW008 or LW009 Exhaust Grille sets from Leopard Workshop, there will be a little surgery involved. 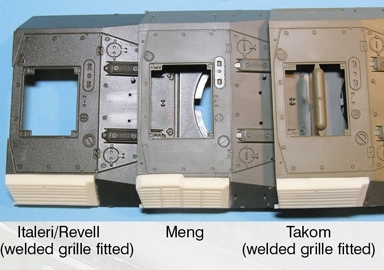 Special care should be taken with removal of the casting block from the grille replacements. Depending on the kit you are using these replacements on depends on how much will be cut away from the existing kit. 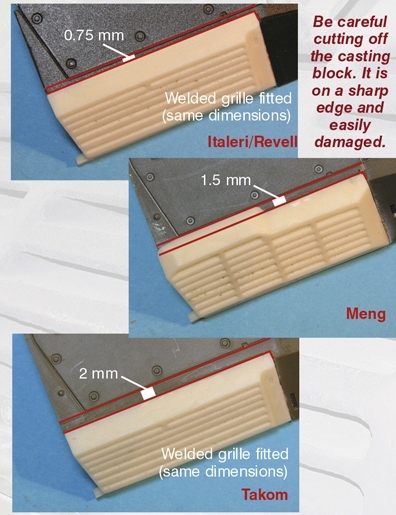 The instructions are clear on the measurements of the cuts and application of the parts. I would suggest that the builder has some experience with modifying kit parts - but this is not mandatory as long as the builder takes the time with careful planning. 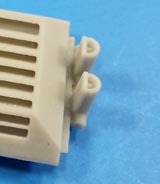 Most modellers without the experience should be able to complete the installation with little to no effort. 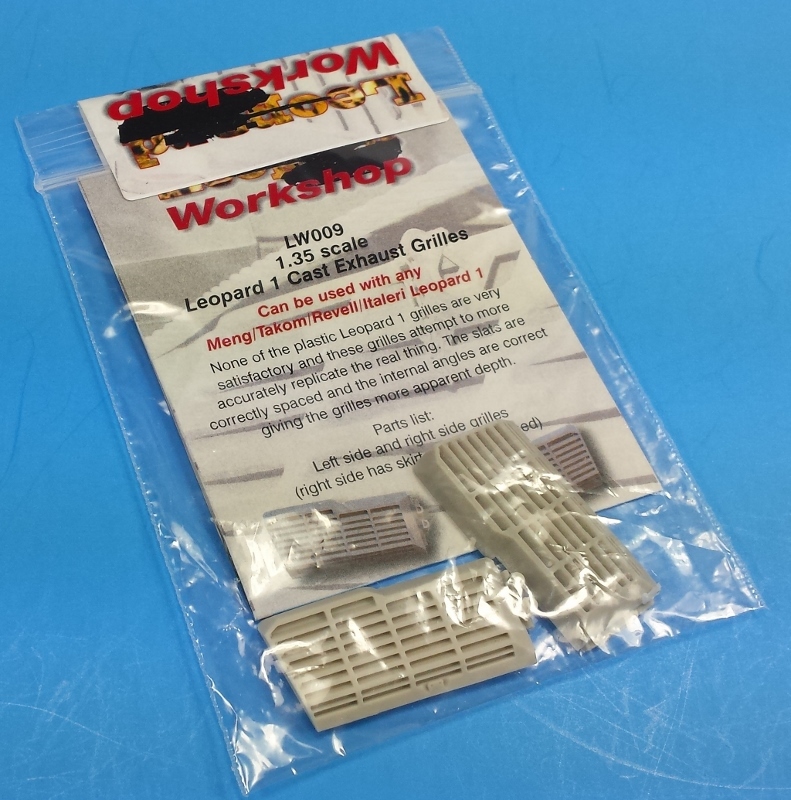 The two 1.35 scale Leopard 1 Exhaust Grille replacements (LW008 and LW009) from Leopard Workshop are certainly the best option for improving the lack-lustre parts Italeri, Revell, Meng and Takom have incorporated into their Leopard 1 model kits. 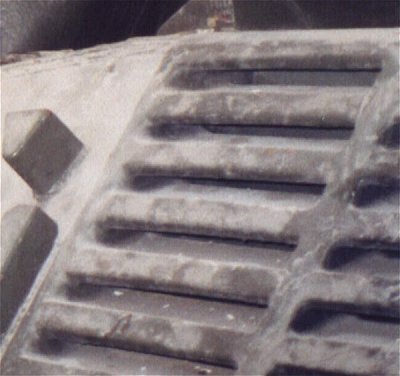 The louvres of the Leopard Workshop parts have the correct spacing and appearance of depth to replicate the original exhaust vents installed both on the early and later versions of the Leopard 1 tank. 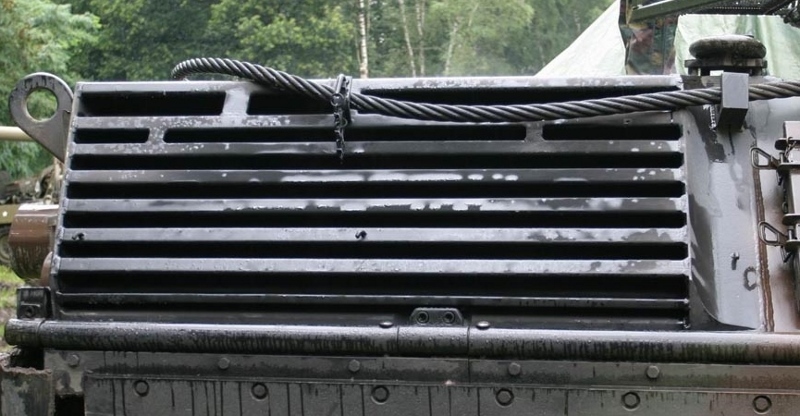 Hands down, if you are looking to improve the look of your Leopard 1 kit, no matter the kit manufacturer, the Leopard Workshop Exhaust Grilles in either the welded of cast versions are your best bet. The quality of these replacement grilles is excellent, the cost is more than fair and the shipping services of Leopard Workshop are reliable! 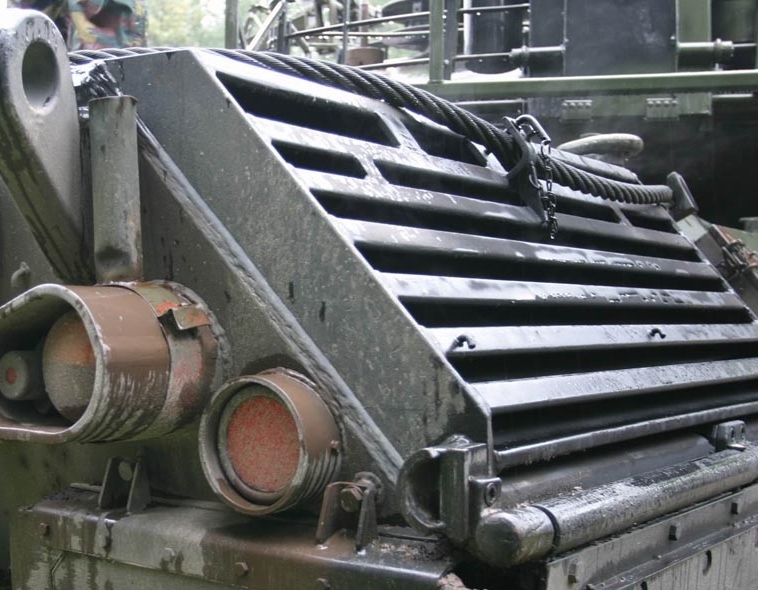 I highly recommend both Leopard 1 Welded and Cast Grilles! 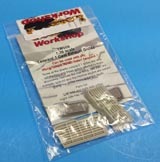 Modeler's Social Club and the MSC Review Connect would like to thank Leopard Club and Leopard Workshop for providing these review samples.